What Is Open Stock Dinnerware? Open stock dinnerware is actually a purchasing option where you can buy individual pieces instead of a prearranged dinnerware set. 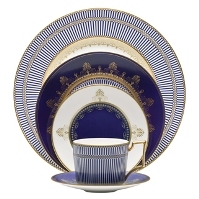 Usually, a dinnerware set contains the most commonly used dishes, including a dinner plate, a saucer or bread plate, a soup or cereal bowl, and a mug or cup. With open stock options, you can actually pick and choose your favorite dishes. How cool is that? The most commonly offered dinnerware set consists of a four-piece place setting to serve four, making up a 16-piece dinnerware set. I usually like the pieces that come in a set, but the options are so much greater in open stock offerings. When you shop for open stock dinnerware you have the flexibility to choose your favorite dishes, the ones that you will use the most. I'm particularly fond of deep bowls and large mugs, so the dishes that are in a dinnerware set don't always meet those expectations and in open stock, there are usually several styles to choose from. Buying pieces gradually through open stock options can be very friendly to your budget. You can actually get place settings one by one and add all of the pieces and serving dishes you desire when you have the money to do it. Another advantage of open stock is that you can mix and match the dishes to create your perfect dinnerware set. This is very beneficial for dinnerware brands like Fiesta dinnerware. It is a great option for accenting home décor with a variety of solid-colored dinnerware with complementary or contrasting colors. Who Offers Open Stock Dinnerware? There are many dinnerware manufacturers and dinnerware brands that make available open stock options. Most fine china patterns are sold in place settings and open stock so that you can take advantage of the many benefits of picking and choosing exactly what you want, need, will use, and can afford. Exclusive shops, like Pier 1 Imports, Macy's and J.C. Penney often carry open stock patterns. The overall advantage of open stock options is that it gives the consumer to the power to choose the dishes that they love to create a dinnerware settings that are truly amazing.